First of all, you need to make some cupcake batter. I just used a chocolate cake mix, but I did use homemade frosting. Use cupcake liners to put in your muffin tin and only fill them halfway with batter. To get the shamrock shape, you need to form foil balls about 2/3 inch in diameter and tuck three of them around the edge of the muffin liners. I think I made the foil balls a little too small. Then bake them according to the package or recipe directions, but for a few minutes less because you are using less batter. I think I filled the batter too high, but they seemed to work out. Now, you need to let let them cool before frosting them. 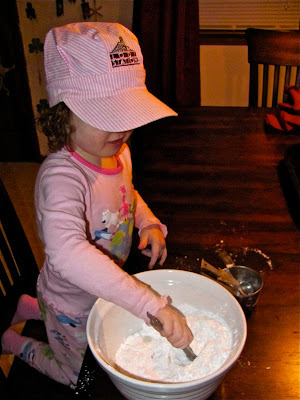 My daughter had no interest in making the cupcake batter, but came around for making the frosting!! For kids, this is the best part!!! I love making homemade frosting because it tastes so much better. Don't you agree? I used an electric hand mixer to beat all the ingredients together. Cassie just waited around for the frosting covered beaters at this point! 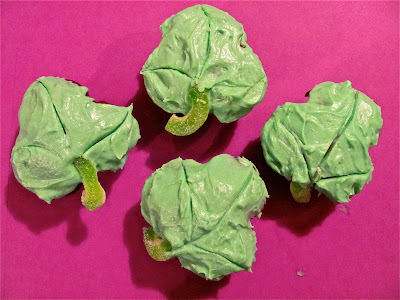 I spread the cupcakes with the green frosting and added vein lines for the shamrock leaves with a toothpick. Lastly, we used gummy sour apple ring candy cut in half for the stems because I couldn't find any green licorice! Here is Cassie putting on the stems. She loved this part! Finished Shamrock Shaped Cupcakes! We shared them with friends today and they were delicious! I think they turned out pretty cool! Now, I think I have had enough green and pots of gold for a while! Melissa, these shamrock cupcakes warm the cockles of my Irish heart. Very creative. On my blog Early Childhood Education and Common Sense, I have a new post reflecting more on Japan, and an idea of groups of university students who are creating origami cranes (a very profound symbol). I wanted to let you know because of your interest. I created a new blog, and am having trouble separating them, so when I comment the title of my new blog appears. I'll have to get my son's assistance on this - he's pretty internet saavy, unlike me. I have that same recipe cut out from Family Fun Magazine 2007, but I haven't gotten around to making them. Yours turned out very well and I bet your daughter had a blast helping. I love creating with kids! Happy St. Patrick's Day! You can read the interview by Dr. Kutcher, if you click on the title of the interview (I guess this is a link?) It is in red. Let me know if you can read it. So cute! The kiddos would love these - and so would their mama! Awesome recipie, going to have to try it this weekend!